There’s very rarely a time when I’m not interested in drinking some puer. This is not true for other styles of tea. There are definitely days when a green tea seems out of place or a black tea too bold. Puer (good puer, anyway) seems to meet every situation with just the right amount of comfort and energy. For example, this 2007 Shou Bing from the Meng Hai factory served to help my digestion after lunch, then brought me peace and relaxation in the evening, and I even made a few pots more the next morning to get my day going. If only I were so adaptable! PS: I believe I picked this up in Kunming, but I don’t precisely remember the shop. I need to start taking photos of merchants with their tea when I buy it. 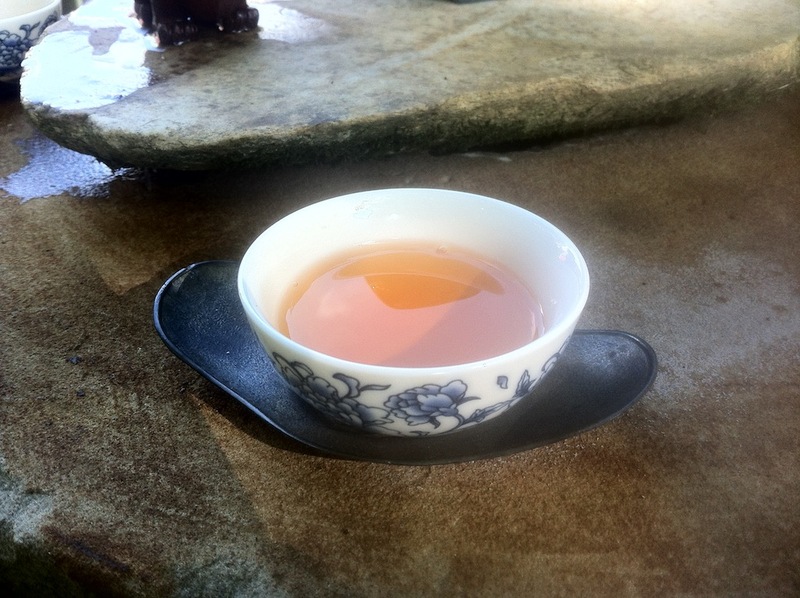 This entry was posted in Tastings and tagged heicha, menghai, puer, tea on July 29, 2013 by payton. 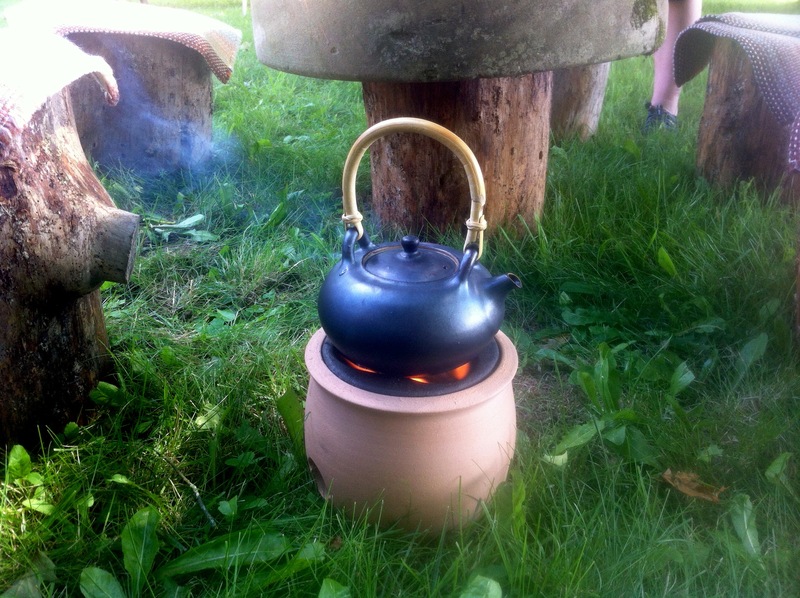 With some success on our first try, my fiancée this afternoon attempted to speed the process of heating the charcoal on our ceramic tea stove. While much was learned, the resulting water was not as hot as we could have liked, and so we searched the tea cabinet for a tea that would fare well with less-than-boiling water. The easiest choice was a well-sealed packet of single-estate organic Gyokuro from 2010 that I had somewhat forgotten about. You know the kind of tea, you were saving it for a special occasion, but eventually it was just too old to use, and so there it sat. Gyokuro, if you’ve never encountered it, is essentially the highest quality tea made in Japan, second only to Matcha in the respect afforded it. That said, all tea comes in many different grades, and nearly all tea produced in Japan is a blend. Unlike China or India, where there is much land to be had, Japan is tiny and overpopulated to the point where growing a tea plantation is out of the question. Tea farms are generally small estates planted carefully wherever the conditions are right. Unfinished tea leaves are then brought to special tasting events where representatives from large tea companies will find a selection of small batches that they like and then finish them all together. This tea, however, is from a single garden in Japan, and it’s certified organic to boot. Also not an easy feat. Gyokuro (meaning “Jade Dew”) is grown only from a specific selection of cultivars of the tea plant and is shaded for several weeks of its growing season just before harvest. This shade, traditionally with bamboo or more modern mesh, causes the plants to work that much harder at finding sunlight. The resulting richness of the leaf is well worth the effort. Of course, it is still a green tea, and the real magic of such things only lasts 6 months or so. So clearly we were skeptical of this find, but that skillful Japanese packaging managed to keep the leaves in pretty good shape after three years. While definitely not the creamy rich and salty experience I would expect from a recent Gyokuro, this still had the characteristic mellow vegetal body coupled with a vibrant green broth. Now the challenge will be to drink the rest of the packet. …Or it may just go back on the shelf. 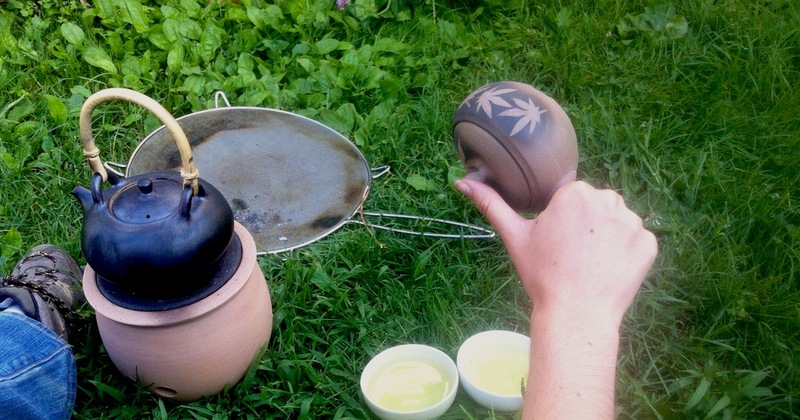 This entry was posted in Tastings and tagged brazier, green, gyokuro, japanese, tea on July 24, 2013 by payton. First I should say, do you know what a Gaiwan (蓋碗) is? Literally, it means “lidded bowl”, so there’s not a lot of confusion. Sometimes it’s also called a “Gaibei” (lidded cup) or “zhong” (Cantonese, if I’m not mistaken). They are made in different sizes and materials, but generally are between 100-200ml and made from white porcelain consisting of a saucer, a bowl and a lid. The porcelain means that heat will dissipate quickly, making it ideal for teas that are best infused with cooler water, such as greens. 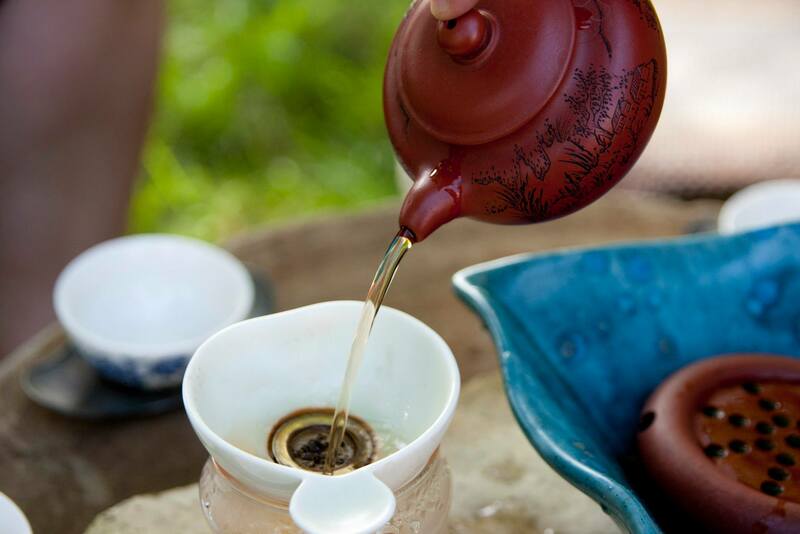 In ancient China, tea was sipped directly from the bowl while the lid was used as a strainer. While it’s possible to find teahouses that still serve this way (I’ve seen it still done in Sichuan), most use of the gaiwan now is as a sort of teapot, allowing the leaves to infuse before straining into a cup (or pitcher) with the lid. As I’ve often told people learning to use a gaiwan for the first time, straining the tea is similar to straining pasta or vegetables from a saucepan by tipping the lid slightly to allow water to leave and retaining what’s inside. And just like with a saucepan, the water inside is quite hot, so you need to take certain precautions. 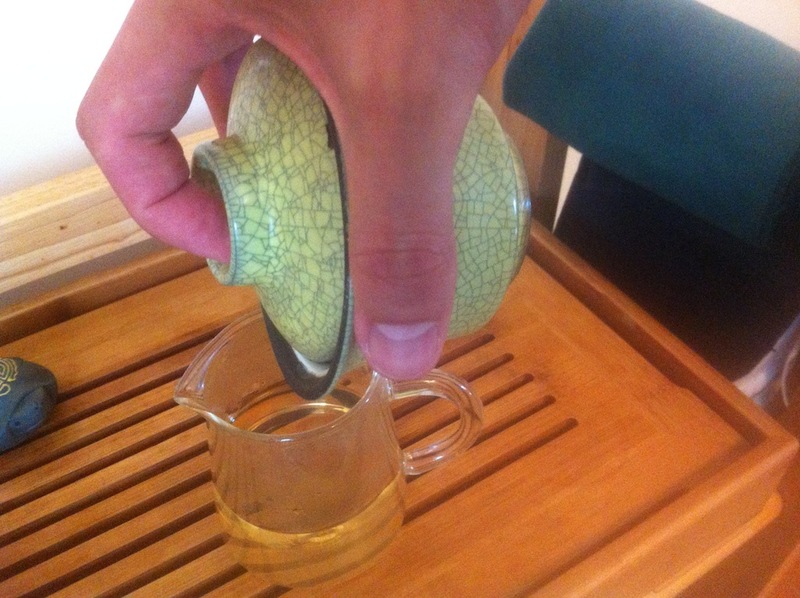 To that end there are several ways to pour a gaiwan. Probably the easiest is the two-handed method: one hand holds the cup by its rim and pours while the other hand holds the lid by its top nub at a slight angle to keep the leaves in. I want to emphasize holding the cup by the rim and the lid by the nub to protect your hands from the heat. 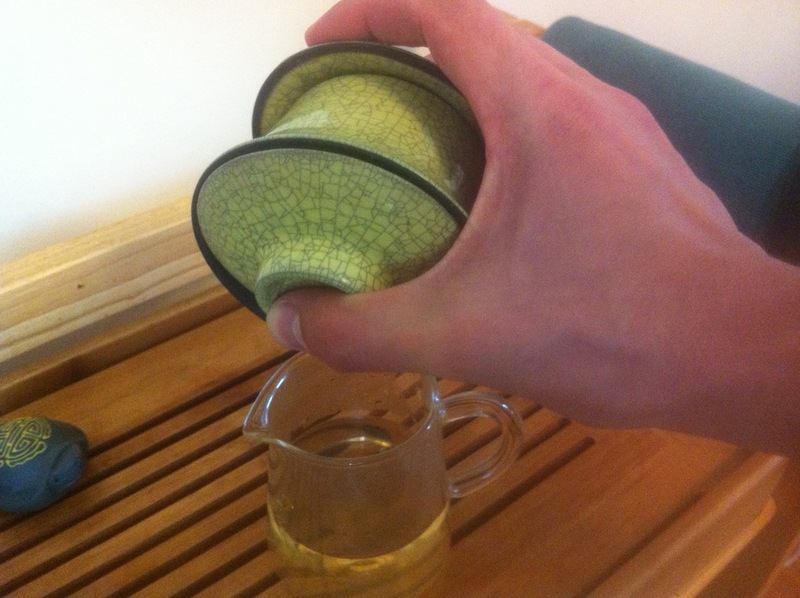 A more common technique is to hold the gaiwan edges with one hand, using the thumb and middle finger on the rim and the index finger or knuckle on the lid. The third method that I use is more advanced in that you are much more at risk of dropping things. I find it most useful when infusing tea gongfu style in a gaiwan, meaning that the water is very hot and isn’t given time to cool before straining. In the other methods, sometimes even the rim is too hot to touch, so it’s possible to hold the entire gaiwan by gripping its saucer and lid between the thumb and the middle finger. Since the lid must still be tipped, this requires just enough pressure to avoid dropping anything, but not so much that the lid will go shooting away from the cup! 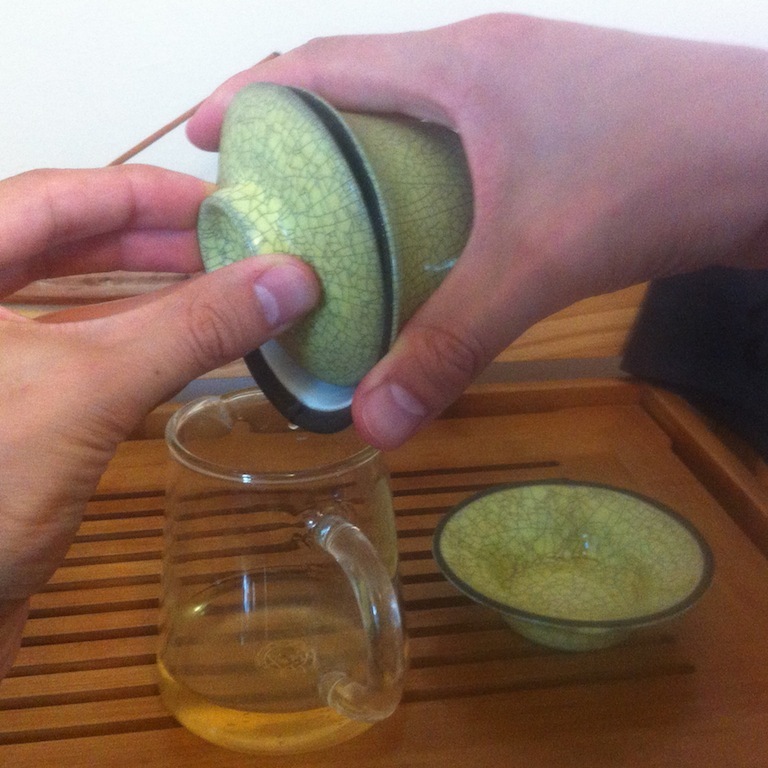 In this method it’s also best to make sure the palm of your hand is on the side of the gaiwan while pouring, or else the steam escaping from the back of the lid can be very unpleasant. While all this may seem like much more work than simply using a teapot, a gaiwan has two significant advantages that no teapot can claim. Firstly, the opening of the bowl is so large that it’s easy to see the leaves and the color of the liquor as they infuse. Especially when first infusing a new tea, this gives you a good way to judge the time of the infusion. Because of this, I would never suggest purchasing a gaiwan without a white interior. Secondly, a gaiwan can pour out its contents within a few seconds, much faster than any teapot, meaning that when you have decided that the infusion time is up, your tea will be poured and ready without any additional steeping that might occur during a long pour. I highly recommend the humble gaiwan as a tool for beautifully making a cup of tea, especially for those new to judging infusion time. The methods listed above are just suggestions based on my own experience, so feel free to find your own way to pour. 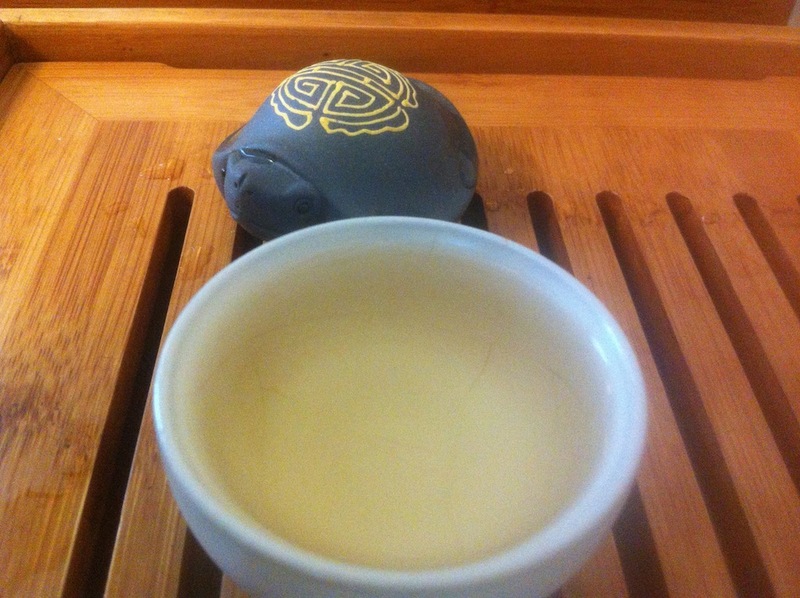 This entry was posted in Teaware and tagged gaiwan, gongfu, gongfucha, tea on July 10, 2013 by payton. Darkly sweet, like a deeply ripe blood orange. An aroma of very dark chocolate with a touch of cinnamon. There’s a subtle dryness and roughness at the end that is typical of some Qi Men teas. Qi Men (aka: “Keemun”) tea (祁門红茶) is a black tea (“red tea” in China) made in Anhui province in Eastern China. It is a style that has been relatively famous in the West for quite a while and is often blended with other, stronger leaves to produce concoctions like the English Breakfast tea. As with any harvest, though, there’s a spectrum of quality that can be had and most of the leaves exported for teabags are literally the bottom of the barrel. A Mao Feng (毛峰) pick is considered a pretty high grade and should have entirely full leaves, gently twisted into spirals. This tea I purchased from an artisan tea and coffee shop in Brighton in the UK. While the staff didn’t know a tremendous amount of tea information, I appreciated that their tea was well sourced and well served. At the shop they used a kind of plastic mug with a drain on the bottom for serving, so the leaves went right in with the water and then the infusion was strained out of the bottom into a ceramic mug when ready. 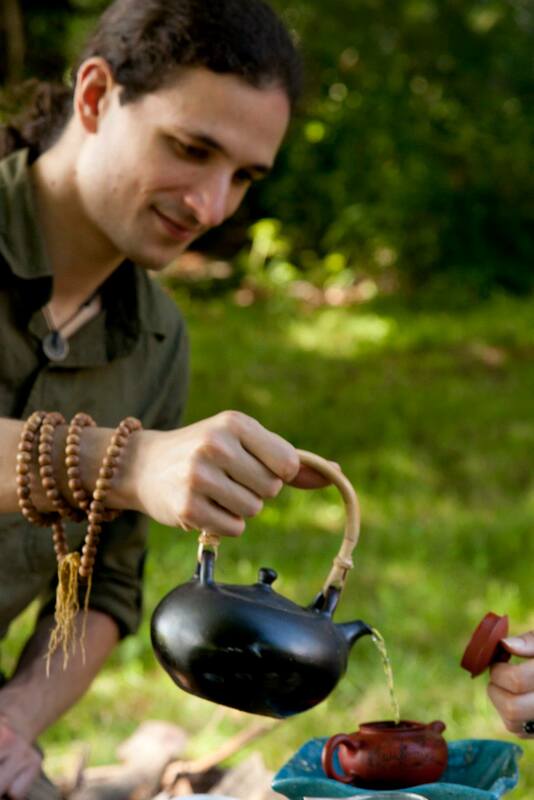 I’m not a big fan of plastic for anything tea-related, but this method did have several advantages which I think many methods of tea infusing lack. Firstly, the leaves were not separate from the water during steeping. Probably the most common way to infuse tea of any sort in the West is to use some sort of separation tool, such as a teabag, tea ball, or strainer. While there is quite a bit of experimentation ongoing with these methods in the form of different fabrics and materials, shape and size, ultimately there is always part of the water which is not coming into direct contact with the leaves. In my experience this never produces quite the same effect as having loose tea leaves swirling around in your pot or mug. The second advantage of these draining mugs was that after the infusion time was up, it’s easy to quickly drain the whole thing into your cup. This means that no tea remains steeping in water while you drink your first cup, which would otherwise almost invariably produce a bitter second pour. The speed was also important since a slow-pouring teapot can make timing your infusion much more challenging than it needs to be. Due to the plastic, I find it hard to recommend these devices in general, but you could do a lot worse, and the above points are definitely worth keeping in mind for your own infusion experiments. Overall I’m very happy with this tea and pleased that there are more shops taking unflavored tea seriously. Thank you, Naked Tea! This entry was posted in Tastings and tagged anhui, gongfu, hongcha, qimen, tea on July 1, 2013 by payton.